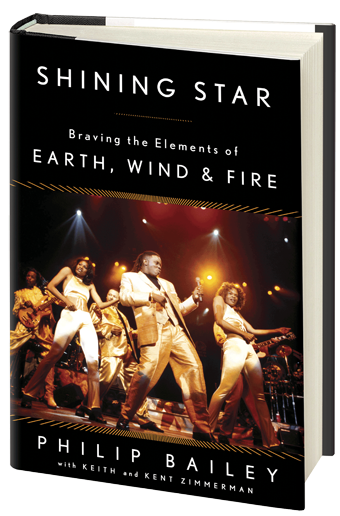 A revealing and heartfelt memoir from the lead singer of the legendary Earth, Wind & Fire. With more than ninety million records sold and eight Grammy awards throughout its forty-year history, Earth, Wind & Fire has staked its claim as one of the most successful, influential, and beloved acts in music history. Now, for the first time, its dynamic lead singer Philip Bailey chronicles the group’s meteoric rise to stardom and his own professional and spiritual journey. Never before had a musical act crossed multiple styles and genres with a quixotic blend of astrology, Universalism, and Egyptology as Earth, Wind & Fire (EWF) did when it exploded into the public’s conscience during the 1970s. The group’s shows became sensory experiences with their dramatic staging, shimmering costumes, elaborate choreography, baffling magic tricks and a thumping backbeat. At the center of it the group was its charismatic founder Maurice White and Bailey, with his soaring multi-octave range and distinctive falsetto. After being signed by recording titan Clive Davis, EWF went on to produce a remarkable series of platinum and gold albums and headline stadiums around the world. As Philip and Maurice were profoundly influenced by genius producer Charles Stepney, as well as famed arranger David Foster, EWF elevated Sly Stone’s multiethnic “I Wanna Take You Higher” message to an even higher level. Bailey hit the wall due to fame, fortune, and the excesses of global success. The constant touring and performing took its toll on him publicly and privately. While White and Bailey’s relentless work ethic shot the band into the stratosphere, it also exhausted and emotionally gutted the group. In 1983, White abruptly dismantled the band, leaving Bailey and the rest of the members to fend for themselves. As a solo act, Bailey recorded “Easy Lover,” a worldwide smash duet with Phil Collins, launching the next stage of his career until EWF reunited later that decade. Shining Star is the true story of what happens when real life exceeds your dreams, when the power and pain of building a legacy brings both joy and faith-testing challenges. Get your copy of Shining Star at your favorite book store.